How good it will feel when you can hit the beach or pool this summer and take your shirt off revealing a lean athletic physique with a muscular chest, wide shoulders, big arms, and a V-shaped back that tapers down to ripped 6 pack abs! In fact, they may even accuse you of taking "steroids" because your body will be changing so fast. But you'll have the satisfaction of knowing that it's all natural and the direct result of the smart intelligent workouts that you've been following from Lee Hayward's "Total Fitness Bodybuilding DVD Training Library." Total Fitness Bodybuilding Inner Circle! & Download Your Programs Today! 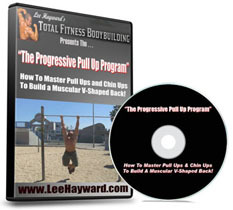 "How To Master The Pull Up & Build A Massive Muscular Back!" "How To Get Ripped To The Bone Shredded In Record Time." "How To Train Beyond Muscular Failure For Maximum Muscle Gains"
"Instructional Weight Training Workouts For Every Muscle Group"
"How To Prepare For & Look Your Best At Your First Bodybuilding Contest."